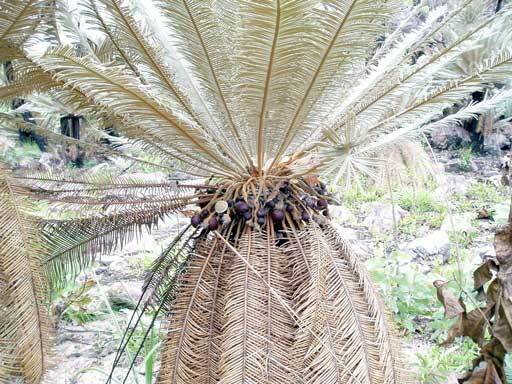 For many years relative to plant studies in our so called Top End, there have been reports of a slender trunked form of Cycas with pronounced silver colouration through the young upright fronds. Great fields of these grow amongst the rocks of limestone outcrops and show the first return to colour in areas annually burned off by aboriginals. 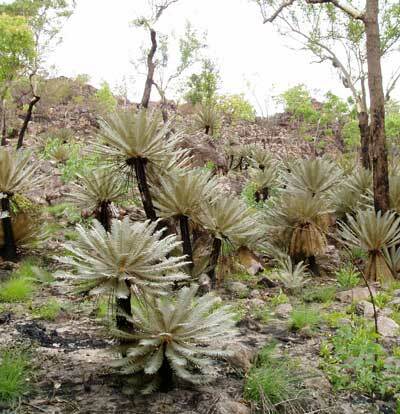 Maconochie, the Northern Territory botanist, was dedicated to the study of the genus Cycas and indeed is credited with the descriptions of two species during the 1970s period; Cycas pruinosa and C. calcicola, the species in question. J.R. Maconochie describes this Cycas in his official papers released during 1978 by the Herbarium of the Northern Territory, Dept. of the Northern Territory, Alice Springs. His listed habitats at that period were always in or near limestone outcrops and in open forest in areas just north of Katherine. Two other populations mentioned being at Bamboo Creek on the Mandora Road south of Darwin and the other on the East Alligator River. Further to this comes reports of finding colonies in the Finniss River area by a young naturalist with all the keen dedication of the late J.R. Maconochie. Don Stallard of Darwin has even had success in getting some Cycas species placed on the 'Trees of Significance' listing. Don is convinced of the possible hybridization in nature of Cycas calcicola and C. armstrongii. It is now evident that the two species spill into each other's territory in the Top End, and Don is convinced that hybrids exist between these species. So far he has found the overlap in the Florence Falls area and north of Katherine and upper reaches of the Daly River. Palm-like shrub to 3 m high, trunk about 17-30cm diameter. 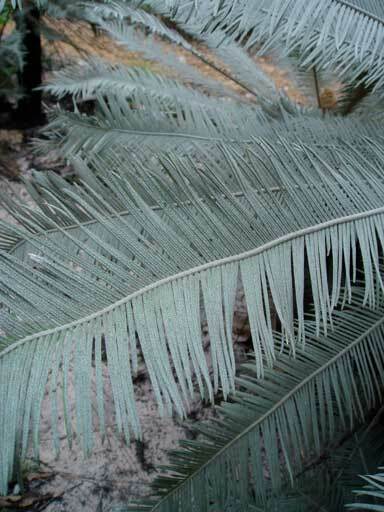 Fronds dark-green, flattened or arcuate in cross section, (60-)80-90(-115)cm long, (9-)15-20 (-27)cm wide. Leaflets or pinhas (150-)200-280 (-300) in number with revolute margins, glabrous or pubescent above, pubescent in channels below. Pinnae 8-12cm long, 2.5-3m m occasionally 4mm wide, straight to slightly curved, apex attenuate to mucronate with a small spine I mm long, slightly angled on the rachis, not decurrent on the rachis. Rachis (including petiole) round to tetragonal towards the base, about 10mm wide and 8mm thick at base to 2mm wide near tip, glabrous scurfy-ferruginous. Male cone narrow ovoid, 17-26cm long and 5-6cm wide, microsporophyll deltoid 15-25mm long, 5mm and 12mm wide at base and apex respectively, with the terminal portion 6-10mm long, grey-pubescent with a hooked tip in the same plane. Megasporophyll ferruginous to 15cm long, with elliptic-rhombic sterile apex and a weakly developed spine 10-16mm long. Sterile apical regions 20-25mm long, 1-1lmm broad with 7-8 fine papery marginal teeth or entire, lower surface ferruginous-pubescent, upper surface glabrous with a mottled brown-green papery or dried resinous surface. Megaspores 2 to 6 per sporophyll, globular-ovoid, brown in colour, surface slightly glaucous, about 32-35mm long and 25-27mm in diameter. 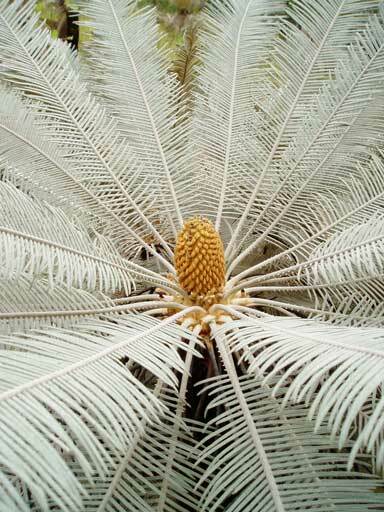 Cycas calcicola Maconochie, J. Adelaide Bot. Gard. 1(3): 175, fig. 1 (1978). TYPE: Australia, Northern Territory, 16 km N of Katherine, 10 Jun 1971, J. Maconochie 1314 (holo NT, 2 sheets; iso BRI, CANB, K, L, PERTH). Etymology: From the Latin calcareus, pertaining to lime, with the suffix -cola, a dweller or inhabitant, in reference to the occurrence on limestone outcrops. Illustration: Elliot & Jones 1984, Maconochie 1978, fig. 1. Hill 1996, fig. 24. Historical notes: Although strikingly distinctive and occurring immediately beside the main (and only) north-south highway in the Northern Territory, this species was only first recognised as recently as 1978 by Australian botanist John Maconochie. in 1978. Distinguishing features: Distinguished by the flat leaves with very large numbers of very narrow leaflets with recurved margins that are persistently tomentose below, and the slender, greyish male cones. Distribution and habitat: Abundant around the Daly River basin and north along the Finniss Range, from Katherine in the south-east to the north of Litchfield Park and near the Daly River Police station, with a somewhat disjunct population in the Spirit Hills on Bullo River station near the Western Australian border. Although originally described from limestone and named accordingly, this species occurs on various often non-calcareous substrates such as sandstones, sandy alluvium and aluminous schists. Conservation status: Widespread, not considered to be at risk. Stems arborescent, to 2(-5) m tall, 16-22 cm diam. at narrowest point. Leaves deep green, semiglossy, 60-130 cm long, flat (not keeled) in section (opposing leaflets inserted at 180° on rachis), with 210-410 leaflets, with white tomentum persistent below to persistent above and below; rachis usually terminated by a spine. Petiole 18-30 cm long, pubescent, spinescent for 10-50% of length. Basal leaflets gradually reducing to spines. Median leaflets simple, strongly discolorous, 50-120 mm long, 2-4 mm wide, inserted at 70-90° to rachis, decurrent for 0-1.5 mm, narrowed to 2.5-4 mm at base (to 90-100% of maximum width), 4-6 mm apart on rachis; median leaflets section flat; margins revolute; apex acute, spinescent; midrib flat above, raised below. 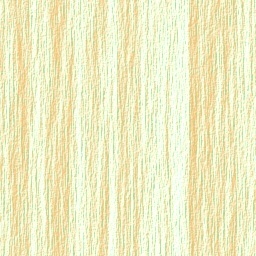 Cataphylls linear, soft, pilose, persistent. Pollen cones narrowly ovoid to fusiform, orange or green, 25-30 cm long, 5-7 cm diam. ; microsporophyll lamina firm, not dorsiventrally thickened, 25-30 mm long, 8-10 mm wide, fertile zone 18-20 mm long, sterile apex 8-10 mm long, level, apical spine prominent, sharply upturned, 7-10 mm long. Megasporophylls 12-18 cm long, grey-tomentose and brown-tomentose; ovules 4-6, glabrous; lamina lanceolate to ovate, 20-25 mm long, 15-20 mm wide, regularly dentate, with 26-36 pungent lateral spines 2-4 mm long, 1 mm wide, apical spine distinct from lateral spines, 6-10 mm long. Seeds flattened-ovoid, 25-31 mm long, 23-30 mm wide; sarcotesta orange-brown, strongly pruinose, 2.5-3 mm thick; fibrous layer absent; sclerotesta smooth. Spongy endocarp absent.